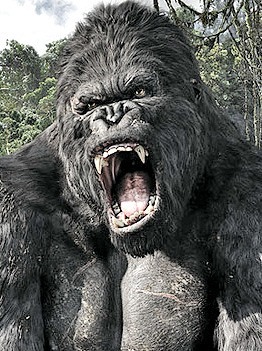 How can mass building workout routines create King Kong muscles? Quarter squat training holds the key. Vigorous leg work is key to building a stronger, more muscular body. And which exercise best transforms your thighs along with the rest of you? Yes, you guessed it, the squat. But did you ALSO realize your squat training style has a critical impact on any gains you might wish to make? Strongman Paul Anderson knew this, which is why quarter squat training became an integral part of his mass building routines and would propel Anderson to squat a monstrous 1800 pounds! Want to know what 1800 pounds looks like? Imagine 4 adult mountain gorillas swinging from your squat bar as you attempt to lift it. Weighing almost a ton, THIS is the kind of King Kong muscle quarter squats can help you build, along with all the monster mass you could possibly desire. So what is the quarter squat training secret? It's simply a numbers game. When performing a traditional deep-knee bend squat, your numbers - or the weight you load onto your barbell - will be considerably less than you are capable of physically lifting. Why is this? A full range squat demands you choose a weight light enough to exercise within the confines of the weakest range of the movement - and when exercising within this weakest range, your muscles are placed at a mechanical disadvantage. The result? A reduced load on your bar. It means you are training your muscles sub-maximally when they can hoist significantly more - a fact acknowledged by lifting colossus Paul Anderson, which is why he made partials training the keystone to his workouts. "I've done them throughout the years. The first partial movement I did was the quarter squat. When I did them for a few weeks without doing full squats, I wanted to see what full squats would be like, so I started doing the full squats again - they felt like a feather!" So how can you turn the squatting exercise to your advantage and build gorilla power? Simply, you must endeavor to train in the strongest range of the movement, as this allows you to exercise your muscles maximally while using the heaviest possible weights. By training the squat exercise in just the top few inches, you can expect to lift up to 100% more weight than you currently use. Now that's what you call REAL gorilla power!